Time to check out Maang? A few of us have spent way too much of our vacation playing around on Maang, the NSW DEC’s new microblogging facility that replaces Yammer. It has been like two weeks of the really fun bits of a professional development day, mixed with watercooler talk. So much to learn, so much to discover, so much to share. I know that I’ve explored only the tip of the Maang iceberg and that it holds many more surprises as we learn more. If you have never dabbled in Facebook or Twitter, but feel like you probably should know something about how social media works – and so many of our students spend a lot of their time (seemingly) perfecting their skills in same – Maang is an ideal opportunity for you to go beyond the possibilities of a professional listserv and to do so among curious colleagues who are also learning. What I’ve enjoyed so far is not just socialising and sharing with TLs in the dedicated Maang groups (there is a Teacher Librarian group with 142 members so far, a Bookweek group, a blogEd group, and many others), but conversing with principals, beginning teachers, IT specialists, teachers located in schools where I used to teach, etc. There have been several online reunions with colleagues from previous schools, and that has been stimulating, too. Listservs have their own conveniences, plusses and minuses, but it’s important to investigate what else is out there in Web 2.0 Land, and to practise, practise, practise. Some browsers will mention a “certificate” problem, but it is a glitch in Internet Explorer. Hope to see you over at Maang! On nswtl listserv this week, some teacher librarians raised the question of “Creative Commons” sections of photo gallery sites, such as Flickr and Google Images, and how they are usually blocked to our students by the DEC firewall because there’s simply no way to police the images and ensure that students won’t be exposed to unsavoury images during a lesson. I’d already been milling some ideas in my head and thought I’d transfer them to here as well. It’s important to keep child protection in mind with ICT. Parents will not tolerate students discovering inappropriate digital images during lesson time, and an open search through Creative Commons may well bring that situation to a head. And too often. My interpretation of “responsible downloading” of images in the K-6 environment is: I use Flickr and Google Image sites with K-6 students to model the search on the IWB, or to a small group clustered around a monitor screen, and we search under my teacher-level username and password. Preferably, I test the searches beforehand. Even then, I once had a class of Stage 1s discover, during an innocent (and pre-tested) image search on “cats”, an unexpected photograph of a startled cat pencil-sharper, with a pencil in its bottom. It caused great hilarity on the day, but it was a reminder that even a well-rehearsed search can go wrong – because new images are added to Flickr and Google Images every minute of the day. And my search-gone-wrong could have been so much worse. Guided Inquiry (ie. Ross J Todd & Carol Kuhlthau) would say that any assignment which leaves students no option but to breach copyright is a poorly developed assignment in the first place. Not too much deep knowledge will be evident in a student’s supposedly-original production that features only cut ‘n’ paste text from websites and/or stolen, uncredited images from Google. The situation really isn’t that different since hideous “projects on cardboard” were invented way back in the 60s? (Earlier?) In those days, students used to cut images out of the school’s encyclopedias – and then photocopiers were invented and suddenly students were able to colour over b/w images they stole and somehow make it all better. If the research question is designed correctly, it can’t be answered by stock text and images. The researched material also needs to be marked and approved by the teacher before final products are created, by which time any plagiarism opportunities should have been eliminated or made redundant (or avoided in the first place). The students who tend to use the Internet responsibly aren’t likely to plagiarise unless their assignments stymie them into doing so. I’m deep into Guided Inquiry with Stages 2 and 3 at the moment and, as their storyboards and oral presentations take shape, there won’t be anyone feeling the need to steal other people’s information. If anyone does decide they need a particular existing image, then we’ll do a modelled search and find the right one in Creative Commons – under my username and password. It’s hard going, but it’s working! Guided Inquiry Endangered animals (Stage 3 science & technology). Recently, on the TL listservs, we were asked to comment on how we displayed series titles, and how we decided which series would become designated special sections and which would be interfiled with the main collection. I decided I usually use the “What drives me crazy and how can I fix it immediately?” method. 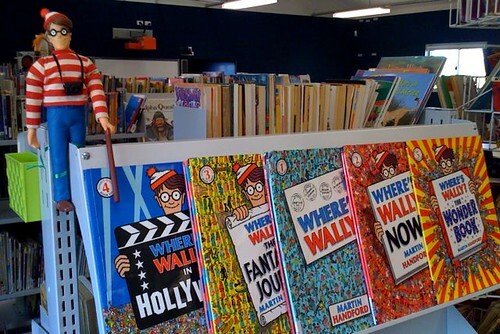 At this school, “Where’s Wally?” books are almost-always out on loan, or if they are “in”, they are all off the display and being read at lunchtimes. In the new library, I have a special, decorated shelf for “Where’s Wally?” books. “Quick Reads” are on a spinner rack and include a pot pouri of “Aussie bites”, “Aussie nibbles”, “Aussie chomps”, “Skinnys”, “Solos”, “Out of this world”, “Hotshots”, “Crazy tales” and “Billy Kool”, etc. Our three levels of “Premier’s Reading Challenge” books are also in their own sections. In the old library, the previous TL was driven crazy by the popularity of “Goosebumps”, so I created a dedicated shelf in Fiction for Stine’s “Goosebumps” series, mainly because otherwise the frantic rummaging for those titles made a complete mess out of the regular “S” shelf. 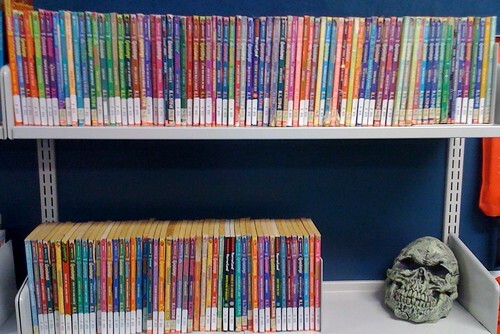 The dedicated display was actually on an empty “G” shelf, but in the new library, “Goosebumps” (more were donated!) take up two whole shelves called “STI – Goosebumps”, situated between the “R” and “T” shelves, and decorated by a hideous, life-sized, Halloween skull. 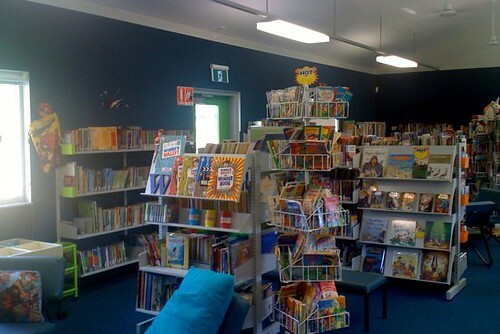 In my previous two libraries, we had dedicated sections for “Dr Seuss” books and “Choose-Your-Own Adventures”, because those books were extremely popular at the time. There’s a new Australian picture book creating a little controversy, I am Thomas, by Libby Gleeson & Armin Greder. I trust Libby Gleeson implicitly and I know Armin Greder’s more confronting illustration work from both “The island” and “The city”. If people thought they were ordering a sequel to Gleeson & Greder’s “Big dog”, they’ll certainly be in for a surprise. I did see “I am Thomas” in the bookshops recently, riffled it, and figured it was a picture book aimed more at secondary students – one to keep on a special shelf for teaching purposes rather than for open borrowing. Last night, I emailed Libby Gleeson, author of the book, for some insights into its theme and purpose. People on the teacher librarian listservs have mentioned that it is included in the current Australian Standing Orders secondary list. Libby is happy for me to reproduce her email on the blog. “It is a dark book in that it deals with the dilemmas of some kids growing up and trying to find themselves in a world of conformity. “For some people that is a real challenge and it isn’t appropriate for little kids. But the notes offer terrific insights and ways to work with the book in classrooms. I notice ‘Magpies’ called it ‘a masterpiece’. Thank you Maurice Saxby! So there you go. Straight from the horse’s mouth. So to speak. Thanks Libby! Fast response! Much appreciated. I understand that some Australian public libraries (City of Joondalup, WA, as one example) now organise their non fiction items in “genres” – presenting the collection more like a bookshop does – and that when they get new (pre-catalogued?) items in, they cover the Dewey spine label with a genre sticker and shelve the books in alphabetical order in genre areas. Hmmm, I’m already having trouble conceiving of many “genres” for non fiction that don’t reconcile with Dewey. I mean, “Animal books” will still end up in the one place whether they have a Dewey number in the 500s or a coloured sticker on the spine that indicates “Animals”. (There have always been people who wished the “Domesticated Animal” books were nearer the other animal books, instead of near the “Agriculture and Farming” resources.) Whether the 500 section ends up in a far corner with a huge heading called “A for Animals”, or wedged between the 400s and the 600s on regular shelves, it’s not all that different to a school library creating a separate Fiction section (instead of all “Literature” over in the 800s), or a funky spinner stand for popular graphic novels. Accurate OPACs give users the location, and it hardly matters a damn, to most people, what the actual Dewey number is. Covering the Dewey number with a sticker does sound a bit extreme, though, creating lots of work undoing the experiment if it fails. Why not show both, but shelve according to one? Surely what the original proposer meant, when he predicted/promoted an end to Dewey was that libraries should always be open to incorporating new ways of responding to its users. Dewey may, one day, be surpassed by a different method of classifying human (and alien?) knowledge. If young people are thinking differently now, due to the multimedia ways in which they (and we) receive and create information every hour of the day (hello Facebook, MySpace, Yammer and Twitter! ), then innovative strategies such as “covers out” shelving (like a modern book shop) instead of “spines out”, grouping books into genres instead of alphabetical or Dewey order, lounging areas and comfy beanbags for browsing, laptop terminals, intermixing fiction and non fiction (eg. putting novels about horses into the non fiction “Horses” section), automated self-borrowing systems, adding terminals for eBook downloads, specialty spinner racks, etc., are just some of the possibilities. You’ll never force everyone into understanding or tolerating Dewey in libraries. Teachers make an interesting group to observe. Probably every teacher in NSW would have been exposed to Dewey in “library lessons” as a student (in the 1950s, 60s, 70s and 80s), and yet I find that the only teachers who “understand” or appreciate the Dewey Decimal System are those who used to be library monitors during their own school days. For most information needs in a school or public library, an OPAC that gives users the exact, unique local location, whether that be a Dewey number of a shelf, a spinner rack near the front desk or a cardboard box in Archives, is all that is needed. Librarians should always be open to testing out new ideas and seeing which innovations work for their users. I thought the stodgy “shushing” stereotype librarian was supposed to be long gone, but now we have people saying, “Don’t take away my Dewey!” and “Don’t dumb down my library!” – which is destined to become old-fashioned the moment innovative ideas are trampled upon before they are even tried. Ha! Can you tell I haven’t shelved a book since early Term 1? Roll on my BER library! A colleague over on the OZTL_Net listserv asked about making her high school library look more like a bookshop, with more of the book covers facing outwards to entice readers. She specifically mentioned those old brown library shelves, with their stodgy, flat canopies, and her unsuccessful efforts to use them as display areas. Does putting an angled display shelf in its place mean overcrowding below? Sure, I said, if that’s all you can manage to do, it’s better than nothing. But I also suggested combining her new arrangement with a savage cull of old books. Crowded spine-out shelves are very uninviting, and it’s the front-out books that will be moving, while the spine-out books will no doubt get ignored by most browsers. There’ll be less books, but the borrowing figures will surely rise! Kevin Hennah, at the wonderful PD day I attended in 2007, heartily recommended ridding all libraries of their antiquated, flat-top canopy shelves. Wherever possible, he suggested shelving that encouraged front-on displays. There are some library furniture catalogues around that have beautiful box-shaped tubs, rather like the old-style LP record bins, for picture books and large format, fully-illustrated non fiction. In libraries with very limited space, or limited budgets, he recommended slant boards (even homemade), that could cover plain, unused shelving bay ends and turn them into attractive display spaces for cover-out books. 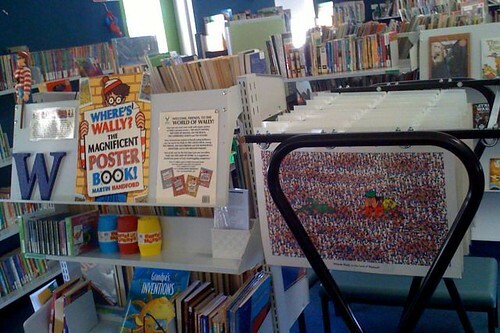 In my primary school library, I had to be even more frugal. I knew we couldn’t justify spending money on slantboards – but I found a range of Japanese plastic wares in a chain of stores (called Hot Dollar), such as hooked baskets and funky, colourful, little magnetic boxes. I also made much better use of two existing spinner racks – it’s impossible to keep them filled! Front-on displays make books *move*! Even assemble-it-yourself wheeled plastic trolleys, also from a “two dollar bargains” store, filled little corners of the library with useful front-on display space. I swapped the slanted display shelving of several old portable magazine racks to convert a set of standard wall shelves into display shelves. Click here for more amazing results! Can you tell I’m just itching for my new library to be built? Book Week is fast approaching! Over on the OZTL_Net listserv, a teacher-librarian asked for ideas for getting students more involved with the annual Children’s Book Council of Australia (CBCA) awards. While there are other, student-voted, literary awards out there (eg. KOALA – Kids’ Own Australian Literature Awards), the CBCA “books of the year” are selected by adult judges, so sometimes the students can feel left out of the judging procedure. It’s not difficult to lead discussion with students as to what are valuable criteria for judging children’s literature. Some categories are easier for students to judge, because they are within the intended audience of certain books. With guidance, Year 6 students can still make incisive observations about what makes a good picture book for younger students. You can also deconstruct the actual rules used by the CBCA judges. * Years 5-6 (Stage 3) are judging Picture Books and Novels for Younger Readers. I supply two empty bar graph grids per student, with the titles written at the base of each column. As we read and appreciate the books, in any order, they give points out of ten and colour their graphs. When all six bars of the graph are filled in, the highest columns are declared the winners and the students record their predictions. They find it very tricky if they’ve voted “ten out of ten” for two or more titles in a category. When Book Week arrives we fill in the actual winners beside their own choices. At my previous schools, we’ve usually done a show-of-hands voting on a class column graph, but individual voting seems to enthuse the students even more. There’s usually a lot of clapping and cheering when I announce the winners at the school assembly in Book Week. I recall really impressing one principal, in my first year as a teacher-librarian. She said, “I’ve never heard these children cheer for a book before…!” – and a few days later there was lots more money in my library budget. Judy O’Connell’s recent post about students and Wikipedia reminded me that there was a very funny post about Wikipedia a few months ago, on the nswtl listserv, whereby someone had found, incidentally, that some fool had sabotaged the entry on the Newcastle (NSW) Earthquake… to say that it was started by someone stamping their foot in anger. Of course, before the first post to the listserv was barely in people’s “In” boxes, someone else, a registered contributor to Wikipedia, had gone into the site to edit the entry back again. And then announced their restorative action on the listserv. 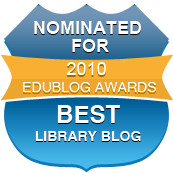 Which caused more consternation because several teacher-librarians had already bookmarked (but not thought to “Save to file”) a copy of the sabotaged entry to use as an example when doing explicit teaching about online research. I’ve been know to use the wiki when I hit a topic I know nothing about, and it usually gives me at least a feel for the type of more authoritative information that is likely to be out there, beyond the Wikipedia entry. Or whether it’s a more obscure topic. And when I’ve found topics that have rather lean (or totally wrong) information, and I know something about them, I’ve been known to add data myself: Number 96, The Magic Circle Club, Luna Park Sydney, Star Trek, Andorians… important stuff like that. 😉 Even cataloguers keep a watch on it. Of course school and university students will be drawn to Wikipedia – like moths to a flame! The key is how we all, as researchers, use that information to keep on investigating! While I agree wholeheartedly that teacher-librians do need to be prepared for those feelings of isolation when things get grim, there are certainly already many effective avenues we can go to for support: professional associations (ASLA NSW and ALIA); “Scan” articles left in key locations around the school; other professional literature; ringing the School Libraries and Information Literacy unit (NSW DET); networking with local TLs and valued, like-minded staff members; and input (and a sympathetic ear) from the Teacher’s Federation contact person. Etc. When I was doing my teacher-librarian retraining in 1990 at University of Technology Sydney (UTS, Kuring-gai), there was a lot of emphasis on TLs being proactive (thanks Ross J Todd, Barbara Poston-Anderson, Jill Buckley, Michelle Ellis and Joyce Kirk). I often read horror stories on the teacher-librarian listservs – about TLs not being appreciated – but I can honestly say that, of the eight or nine long-term Principals I’ve had over my teaching career, they’ve either already been staunch or open-minded supporters of the school library (and the teacher-librarian), or else I’ve helped to educate them into being supportive. I once proved to myself – in a large school – that the effective way to the Principal’s ear was through the executive staff – one by one… until they were all on-side. My side. My proactive message, proudly modelled for all to see in collaboratively planned and negotiated lessons every week, eventually won through – because it wasn’t ever only me repeating the mantra of what was to be the TL’s desired contribution. (And I shocked even myself, turning a “non negotiable timetable set in stone with no team teaching” into a fully cooperative timetable after only one full year at the school). And if I’ve somehow led a charmed life and simply fluked it into good schools with good Principals my whole career, I apologise. I reckon I’ve made plenty of lemonade out of my piles of lemons over the years. Since when have Principals been the enemy? (So much for the old stereotype of the Principal married to a teacher-librarian.) I think that it’s great that Principals swap notes about what their TLs do. Because surely no one is going to be convinced to downgrade their TL’s contribution – on the whim of another Principal’s misguided opinion – if the whole staff at a school hold that TL and their work in high regard. Surely, even the most stubborn, unconvinced staff can be won over, person by person, if you have to. The poster also mentioned TLs being used as “dogsbodies”. A few times, as TL, I’ve been delegated a job that might be considered a dogsbody’s job. Current case in point: distributing The School Magazine to teachers every month, which no one else wanted to do any more. I made it my special duty last year (and this year): mentioning exciting ways to use it in staff meetings, finding the links to class programs, printing out free online guidebooks, and (even) making teachers feel a bit guilty for not using the resource wisely. Custodian of the school web site? Suddenly the school library became the hub where all material for the web site is generated and maintained, and integrated into collaborative planned and/or taught lessons in the library. I know of other TLs who have inherited Stewart House Rep, SRC Coordinator, School Yearbook Editor, School Historical Artefacts Cupboard Custodian, Chess Club, or Choir – and each can become either an intrinsic joy of the job, or an unwanted albatross, depending on the way you look at that glass: half full, or half empty. Today I received lots of encouraging feedback on yesterday afternoon’s staff meeting about blogs, wikis and OASIS Web enquiry, so I’m feeling a lot bouncier than last night. I will be ensuring to revisit the wiki pages with each class group that comes into the library. The more often the teachers see their students reacting positively with wikis and blogs the more I hope they see the same potential in Web 2.0 as I do. Email: electronic letter writing. Advanced users attach files and graphics. You can “cc” (carbon copy) to others of your choosing. Listservs: one post of an email can be received by all people subscribing to the listserv, even though you’ve posted to the one address. Unable to change content of an email once people on the list have received it. Set up and administered by a “list owner”. Send automated commands to an email address to join or quit a listserv. · RDF (Resource Description Framework) Site Summary. Click HERE to send Ian an email, or please feel free to leave a comment on the blog. ianmclean on Building a library! seaofbooks on Building a library!